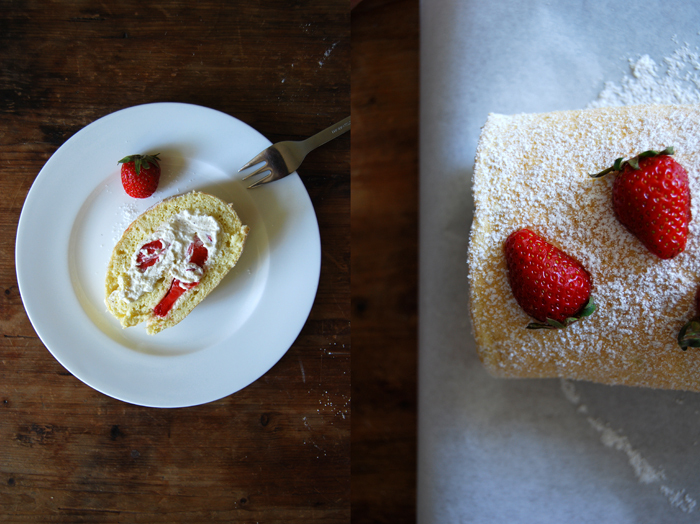 This is the ultimate strawberry dessert to me, the lightest sponge roll you can imagine filled with vanilla whipped cream and lots of sweet red berries. This cake just makes me happy, and lots of my friends too! 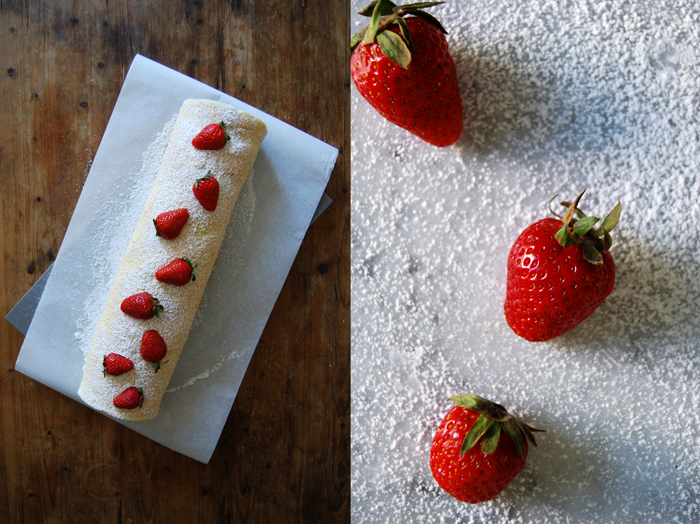 There are many cakes, pies, creams, meringues, puddings or trifles which can be tastefully refined with strawberries but nothing beats my fruity summer roll. There is only one variation on this roll which is as good but it demands a bit more work and time, and that’s to replace the whipped cream with a Bavarian vanilla cream. It has the same effect on me, I just can stop eating it! For now it’s whipped cream which makes this dessert a very quick one. The sponge dough only needs 6 minutes in the oven and it can even be prepared a day before. 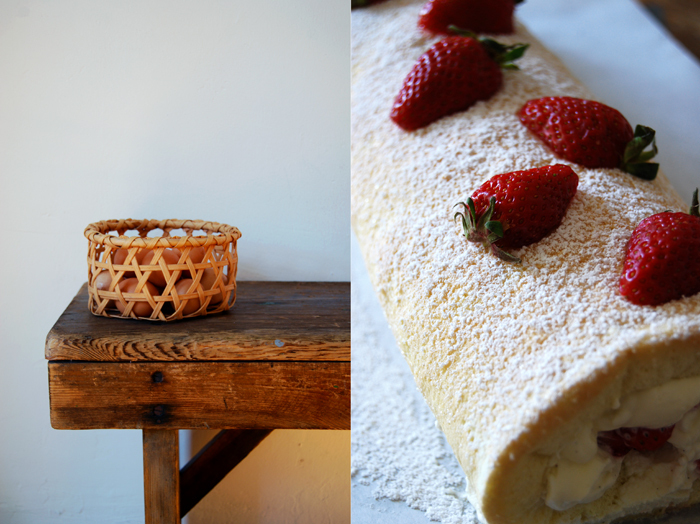 Then you just need to whip the cream, cut the berries and roll everything up in a big, beautiful roll. 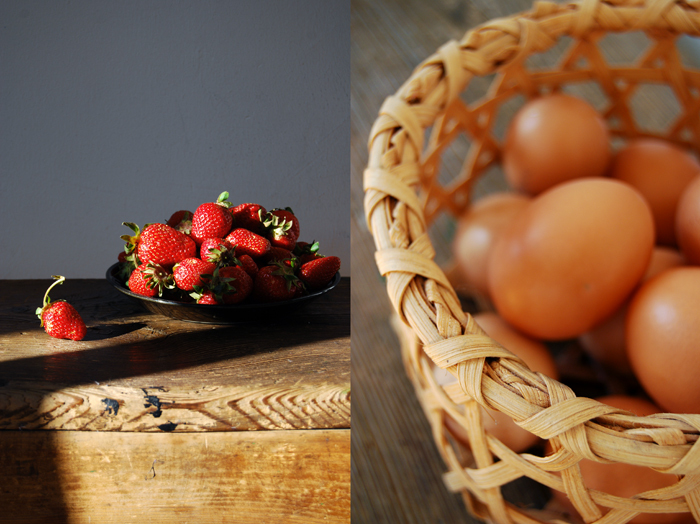 I love to eat it at tea time on a Sunday, preferably on a sunny day in my mother’s garden in the countryside. Sitting in the shade under one of her big trees, a plate of this creamy cake in my hands is one of the best treats in June I can imagine. I’m lucky, I will be there next week and I’m sure I’ll bake it again! 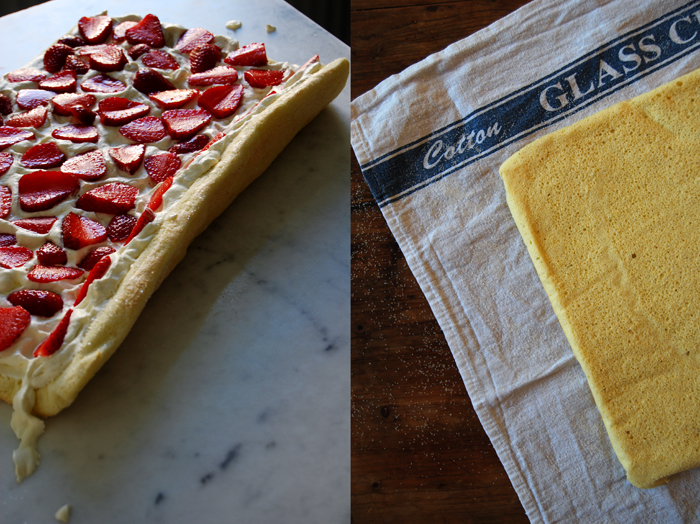 Set the oven to 220°C (top / bottom heat) and line a baking sheet (around 38 x 30cm / 15 x 12″) with parchment paper. Whisk the the egg whites with a pinch of salt for 10 seconds, add 40g of the sugar and continue beating till stiff. Mix the egg yolks with a pinch of vanilla and 60g of the sugar for a few minutes till thick and creamy. 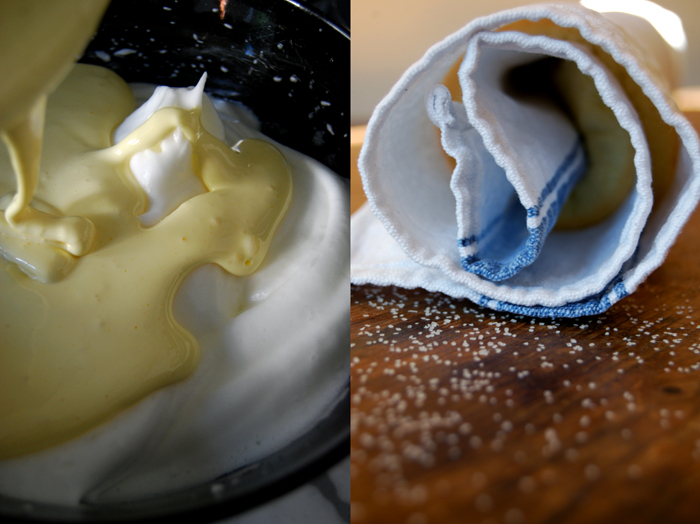 Fold the egg whites with a wooden spoon into the egg yolks. Combine the flour and cornstarch and fold gently into the egg mixture. Spread the dough on the baking sheet and bake in the middle of the oven for 6 minutes until spongy. Sprinkle a kitchen towel with sugar (around 2 tablespoons) and flip the hot sponge onto the towel. Roll it up carefully as you can see in the picture below and let it cool. Whip the heavy cream with a pinch of fresh vanilla and 1 1/2 tablespoons of sugar (or more if you prefer it sweeter) till thick. Unwind the sponge roll carefully and lay it flat onto a working surface. Spread the whipped cream on the cake, cover with slices of strawberries and roll it up again, slowly and gently, not to squeeze the cream out from the sides. Dust with icing sugar and decorate with the strawberries cut in half. Serve immediately or keep in the fridge for a few hours before serving. As an english homeowner she provides your knowledge to share with you know-how about civilization the UK, trips, Pet attached site content, expa.